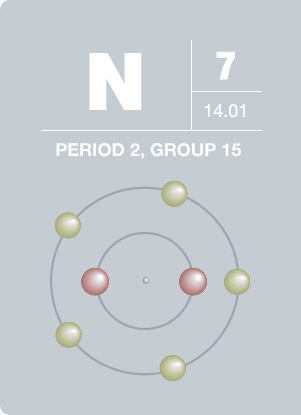 The N1s region may be overlapped by peaks from tantalum, molybdenum or cadmium. In the case of molybdenum, collect the full Mo3p / N1s region (370–455eV), making sure both Mo3p3/2 and Mo3p1/2 components are acquired. In the case of tantalum, it will be sufficient to collect only the Ta4p3/2 / N1s region (370–450eV). When analyzing nitrogen-containing hafnium compounds (e.g., nitrided hafnium silicate), the plasmon loss feature from the Hf4p3/2 feature badly overlaps the N1s region. Acquire the N1s / Hf4p3/2 region and the associated hafnium plasmon (365–410eV). During sputter profiling, if nitrogen is observed when it should not be present, this probably indicates a leak to air in the argon supply. 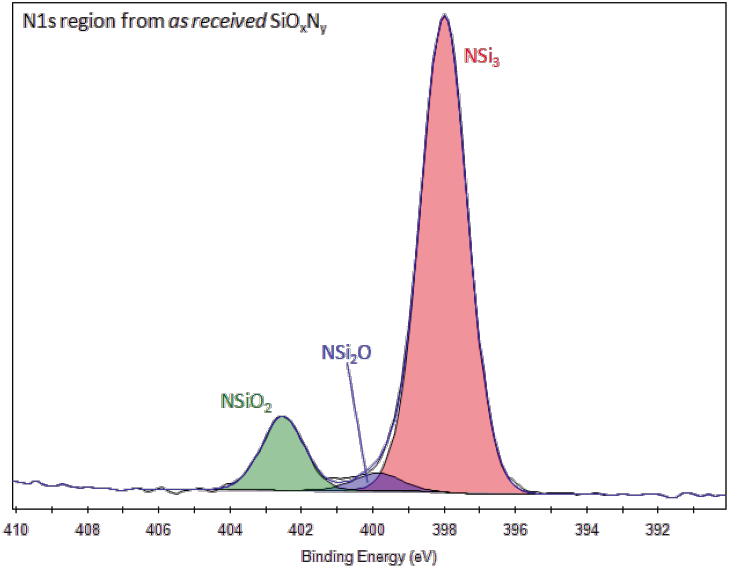 A variety of nitrogen bonding states may be observed in as received silicon oxynitride samples. Higher binding energy states (with oxygen atoms substituted in place of silicon) are thermodynamically unstable (and are typically not observed for annealed silicon oxynitride samples). These states decay rapidly with Ar+ sputtering, even at low beam energies. 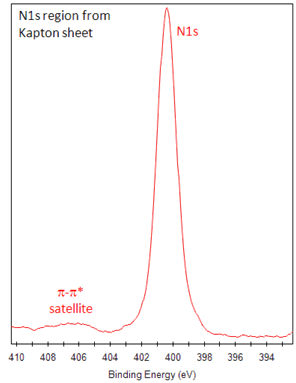 Sputter profiling cannot be used to depth profile these states. Angle resolved XPS is the appropriate method for identifying the depth distributions of the nitrogen chemical states. N1s peak shapes for metal nitrides (e.g. TiN) can be complex and unusual, possibly with presence of surface oxynitrides. 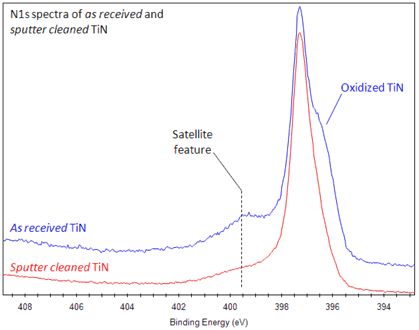 In the case of as received TiN, the oxidized nitride state in the N1s region is observed at lower binding energy compared to the pure nitride state. Oxidation normally moves components to higher binding energy (e.g. NiSi2O compared to NSi3). 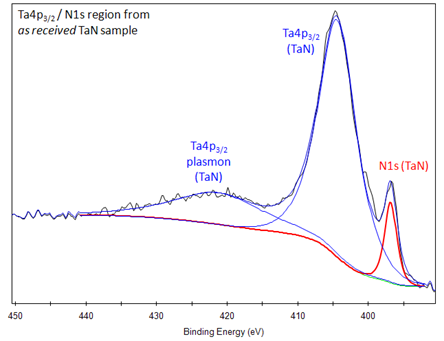 The overlap between the N1s and Ta4p3/2 region can be resolved with peak fitting. This will be necessary when analyzing TaN, for example. Nitrogen-containing aromatic polymers (e.g., polyimide) may have weak π-π* satellite features shifted several eV from the main nitrogen peak. GM Rignanese et al., Phys. Rev. Lett. 79, 5174 (1997). As a crucial part of amino and nucleic acids, nitrogen is vital to all forms of life. It was discovered by Daniel Rutherford in 1772. However, compounds of nitrogen were recognized in the Middle Ages. The mixture of nitric and hydrochloric acids is able to dissolve gold. Normally a gas, nitrogen is colorless, odorless, and tasteless. Found abundantly, nitrogen constitutes 78% of Earth’s atmosphere. The largest commercial use of nitrogen is in the form of ammonia. Nitrogen also provides an inert atmosphere in tanks containing explosive liquids. Liquid nitrogen is a common cryogen, used in the preservation of bodies and reproductive cells and for the storage of biological samples.